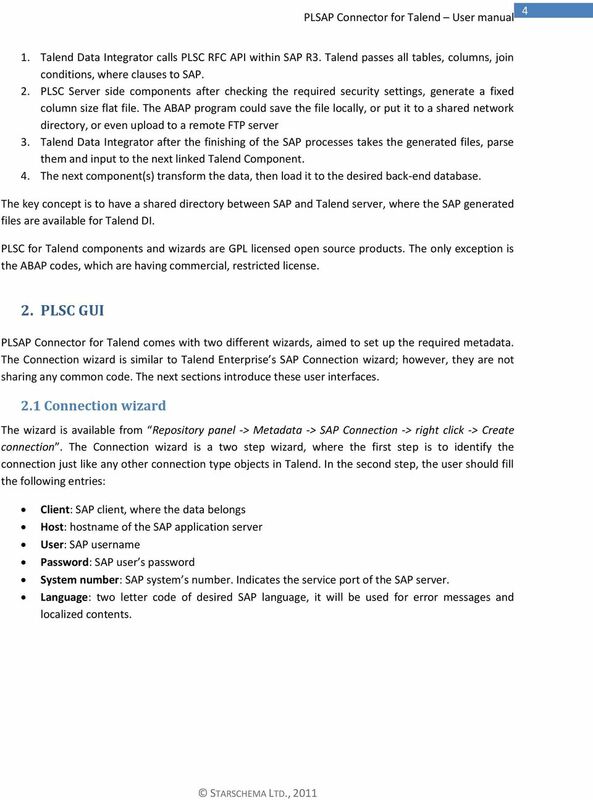 Download "PLSAP CONNECTOR FOR TALEND USER MANUAL"
4 4 1. 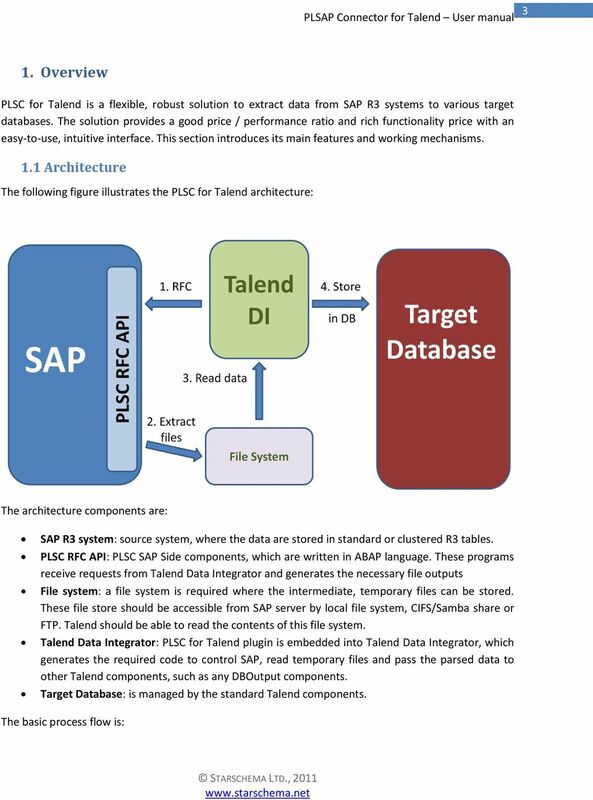 Talend Data Integrator calls PLSC RFC API within SAP R3. 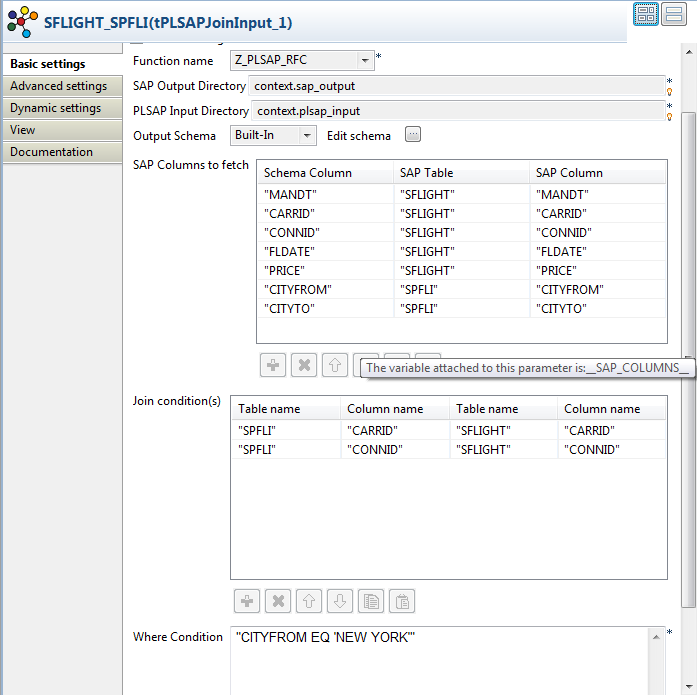 Talend passes all tables, columns, join conditions, where clauses to SAP. 2. PLSC Server side components after checking the required security settings, generate a fixed column size flat file. 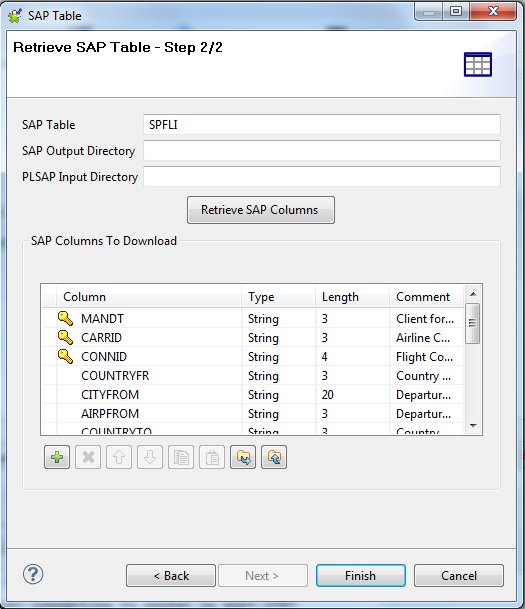 The ABAP program could save the file locally, or put it to a shared network directory, or even upload to a remote FTP server 3. 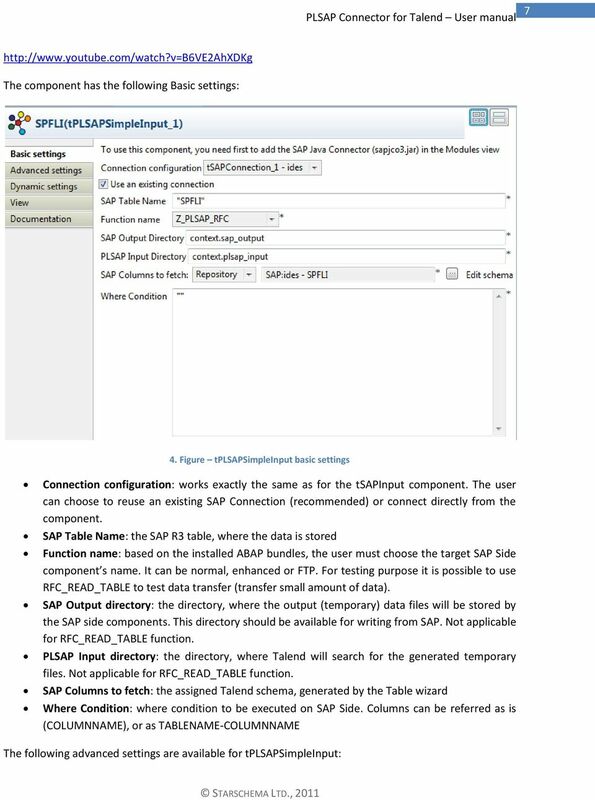 Talend Data Integrator after the finishing of the SAP processes takes the generated files, parse them and input to the next linked Talend Component. 4. 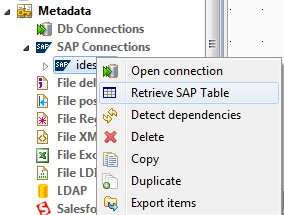 The next component(s) transform the data, then load it to the desired back-end database. The key concept is to have a shared directory between SAP and Talend server, where the SAP generated files are available for Talend DI. PLSC for Talend components and wizards are GPL licensed open source products. The only exception is the ABAP codes, which are having commercial, restricted license. 2. 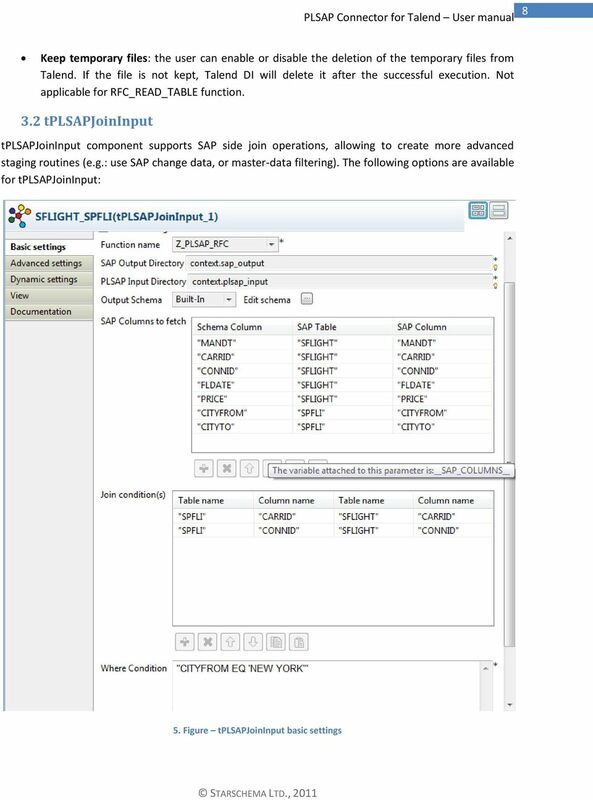 PLSC GUI PLSAP Connector for Talend comes with two different wizards, aimed to set up the required metadata. 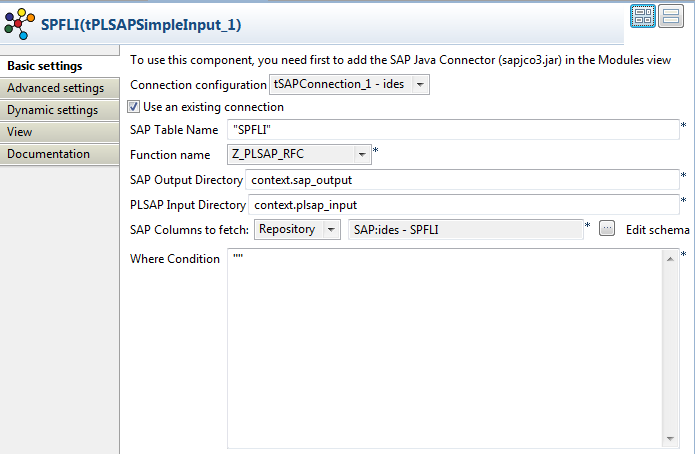 The Connection wizard is similar to Talend Enterprise s SAP Connection wizard; however, they are not sharing any common code. The next sections introduce these user interfaces. 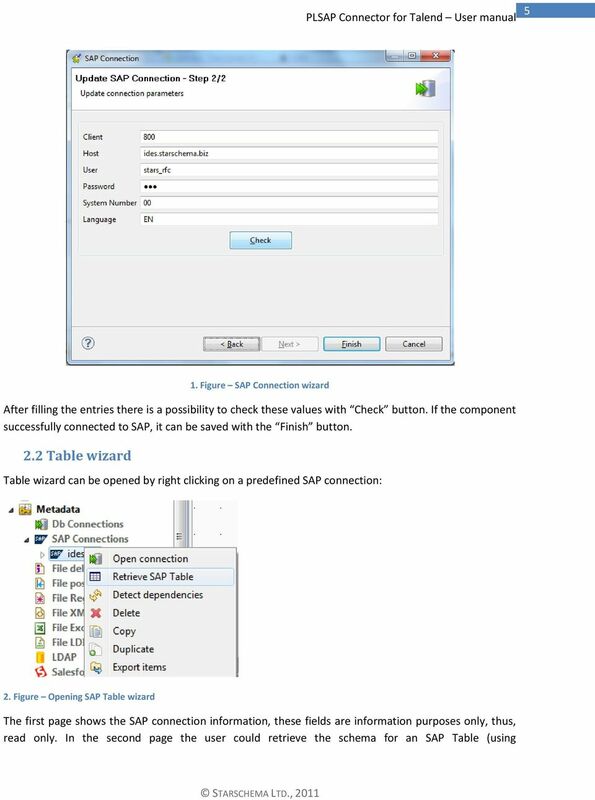 2.1 Connection wizard The wizard is available from Repository panel -> Metadata -> SAP Connection -> right click -> Create connection. The Connection wizard is a two step wizard, where the first step is to identify the connection just like any other connection type objects in Talend. In the second step, the user should fill the following entries: Client: SAP client, where the data belongs Host: hostname of the SAP application server User: SAP username Password: SAP user s password System number: SAP system s number. 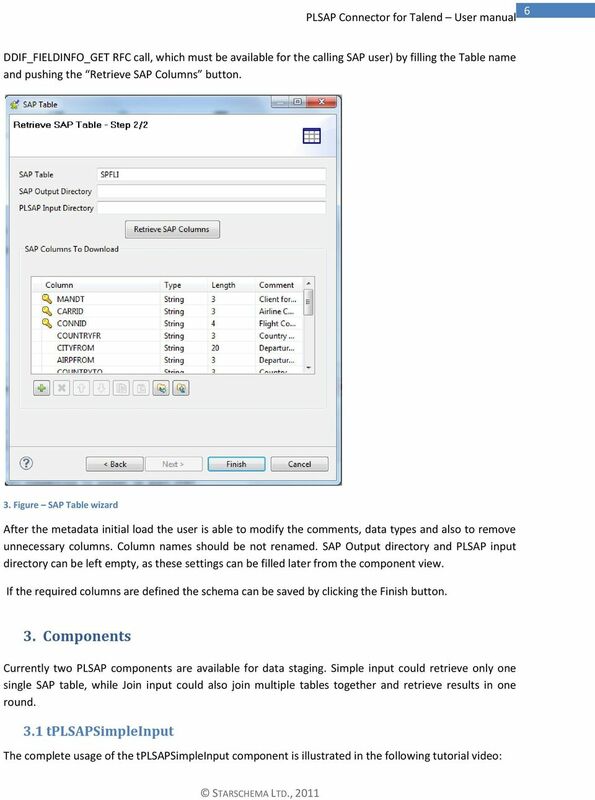 Indicates the service port of the SAP server. 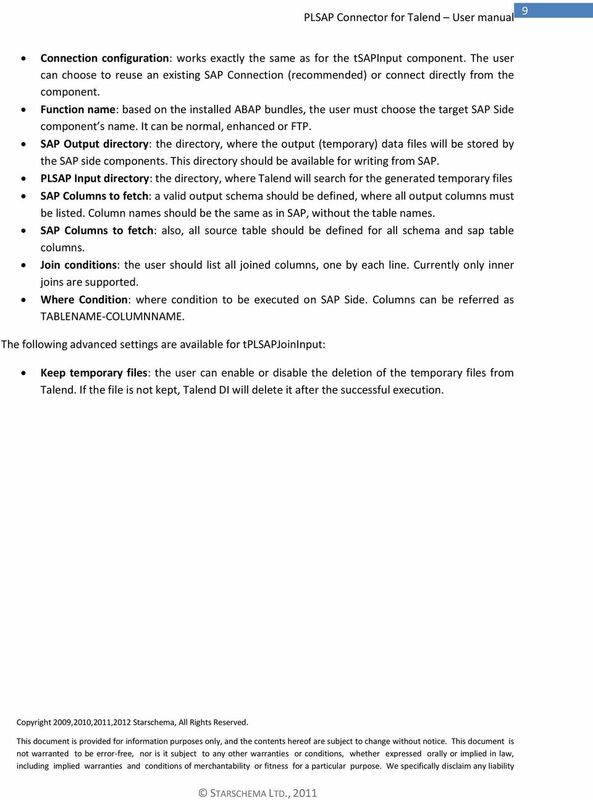 Language: two letter code of desired SAP language, it will be used for error messages and localized contents. 10 10 with respect to this document, and no contractual obligations are formed either directly or indirectly by this document. This document may not be reproduced or transmitted in any form or by any means, electronic or mechanical, for any purpose, without our prior written permission. 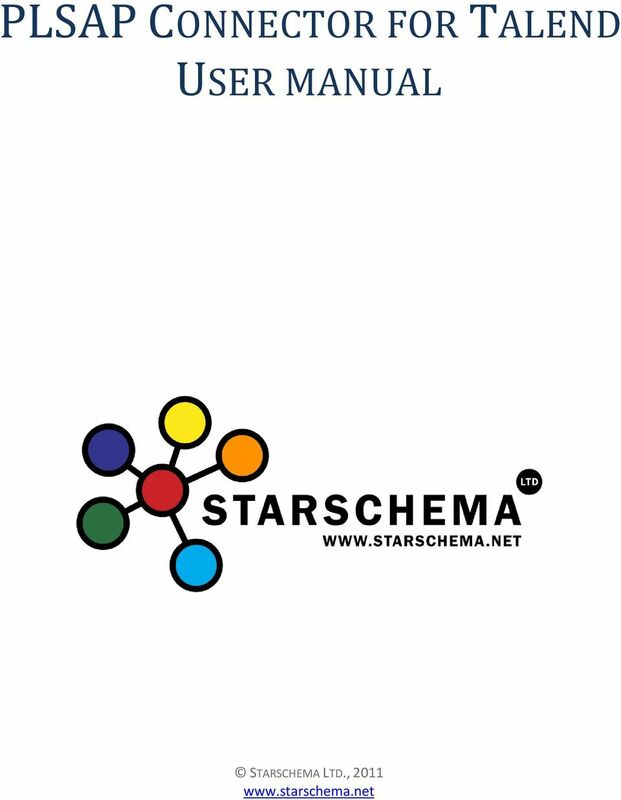 Starschema is a registered trademark of Starschema Limited. Oracle is a registered trademark of Oracle Corporation and/or its affiliates. Business Objects and the Business Objects logo, BusinessObjects, Crystal Reports, Web Intelligence and Xcelsius are trademarks or registered trademarks in the United States and/or other countries of SAP AG and/or affiliated companies. Other names may be trademarks of their respective owners. 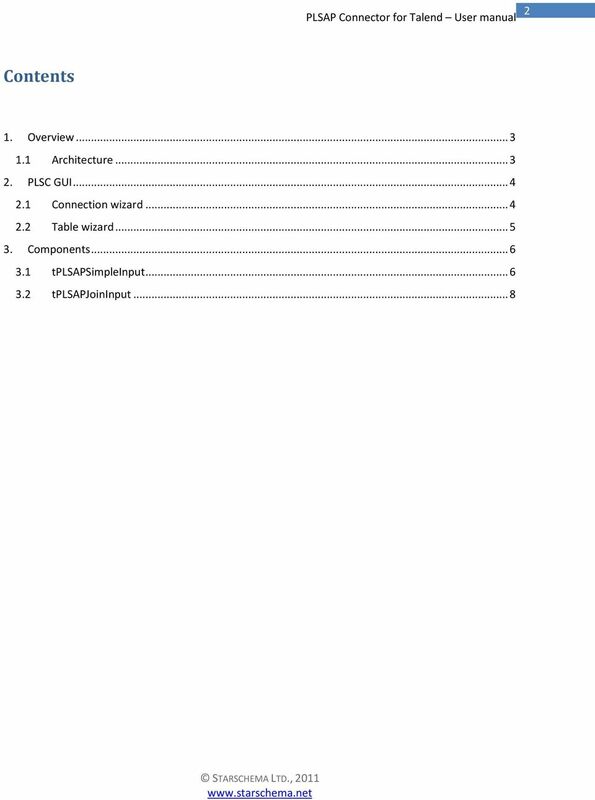 AC 10.0 Centralized Emergency Access Customer Solution Adoption June 2011 Version 2.0 Purpose of this document This document is a detailed guide on the emergency access capability of Access Control 10.0.